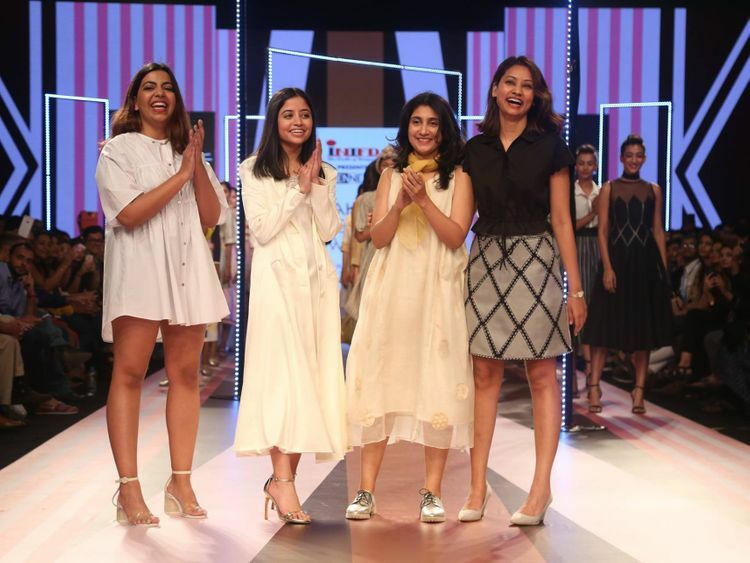 Four designers, all women, took a proud bow together at the Gen Next show on day one of the Lakme Fashion Week (LFW) summer-resort 2019. Mumbai-based Madhumita Nath was an exception for the Gen Next show, which usually has talent in the age group of 20 to 30. Nath is 40 years old, and her addition goes to show how the LFW platform is being more inclusive. “It was great to see women power on the stage... It may have been the first time that four women designers were on the Gen Next stage. I think as women, we have a different sensibility, and a different way in which we want to work. “I would like to believe women would know how to drape a woman better,” said Nath. The designer’s label Ek Katha showcased a new line called ‘Bliss’. A textile design graduate from the National Institute of Design, Ahmedabad, Nath used weavers from Kutch and Odisha to create a cotton-based textile, and then used natural dyes. Her ensembles on the ramp saw a serene mix of natural, beige, raw white, mocha and soft yellow, all embellished with organic prints. The silhouettes were kept very relaxed, laid-back and bohemian. There was also Delhi-based Amrapali Singh, who thinks it was “pretty amazing” to have a bouquet of women for the Gen Next show, which in the past has given the Indian design community names such as Rahul Mishra, Aneeth Arora, Masaba Gupta and Nachiket Barve to name a few. Singh’s ‘Queen of Hearts’ collection under her label Birdwalk was all about simple, comfort and playful appeal inspired by the pack of cards. With Giza cotton, net, cotton silk organza and silk chiffon as the base, she limited the colour story to red, white and black. The Gen Next show, she said, is a “ready recipe which shows this is what you could do”. Khera, who has a celebrity client list of Bollywood stars such as Sonam Kapoor Ahuja and Kriti Sanon, interned with couturier Gaurav Gupta. Her collection called ‘A Long Way Home’ was an expression of grief. As for Bhadu, who has studied fashion in New York and interned with Bibhu Mohapatra, Oscar de la Renta, Theory and Philip Lim, her collection in vibrant hues was a fusion of cultures and crafts with textiles which were merged with colour and silhouettes that resulted in a fun but functional and wearable line of clothes.